Kirk Miller graduated with a Doctorate of Veterinary Medicine from Colorado State University in 1995 and went on to an Internship in Small Animal Medicine and Surgery at the Angell Memorial Animal Hospital in Boston. He became certified in Canine and Feline Practice through the American Board of Veterinary Practitioners in 2002 and recertified in 2012. 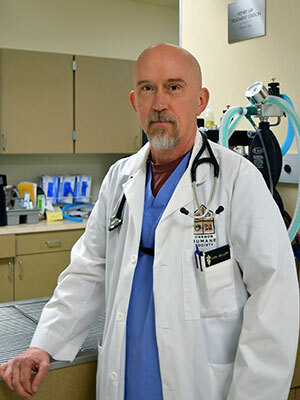 Dr. Miller has been a Clinical Instructor with the Oregon State University College of Veterinary Medicine teaching the Small Animal Primary Care rotation since 2007. Current research activities include investigating the natural incidence of heartworm disease in dogs in the Willamette Valley of Oregon, exploring the treatment of anorexia in shelter cats, and studying the safety and efficiency of high quality/high volume spay/neuter techniques.<br>He lives in Portland, OR with his wife, daughter, 3 cats and a dog. In his spare time he enjoys outdoor activities, rides/tinkers with a Russian motorcycle with a sidecar, and plays the mandolin in a Bluegrass band. Yes, there is more than one way to spay a cat! Spay/neuter is a rapidly growing and changing field within the profession. This lecture will cover a variety of topics including ovarian pedicle ties in cats, scrotal neuters in canines, and ovariectomies in canines and felines. Recently published research (by the speaker) involving ovarian pedicle ties will be discussed and presented. Knowing some of these techniques may improve your efficiency and/or make surgery more enjoyable.